The action-packed third installment of the blockbuster Divergent Series, 'Allegiant' takes Tris and Four into a new world, far more dangerous than ever before. After the earth-shattering revelations of Insurgent, Tris and Four travel beyond the wall enclosing Chicago to seek out a peaceful solution for their fractured city. Once outside, old discoveries are quickly rendered meaningless with the revelation of shocking new truths. As a ruthless battle ignites which threatens all of humanity, Tris is forced to make impossible choices of courage, allegiance, sacrifice and love. 'The Divergent Series: Allegiant' stars Shailene Woodley, Theo James, Naomi Watts, Octavia Spencer, Jeff Daniels, Zoë Kravitz, Miles Teller and Keiynan Lonsdale, and directed by Robert Schwentke. The 'The Divergent Series: Allegiant' competition has now closed. Winners will be announced shortly. Competition opens at 5pm AEST on Sunday 24th July 2016 and closes at 11:59pm AEST on Sunday 31st July 2016. Five winners will be chosen at random on Monday 1st August 2016. To successfully win, entrants must fulfil the above entry conditions before the time the competition closes. Current members/followers are eligible to enter the competition. Only one entry per person. Only one winner per household. To be a valid winner, the entrant must not have won a prize from SWITCH within the last 28 days. Each winner will receive one Blu-ray copy of 'The Divergent Series: Allegiant'. By entering, you agree to receive occasional emails from SWITCH in the future. If you decide to unsubscribe from these updates, any further entries will not be applicable. Only Australian residents are eligible to enter. 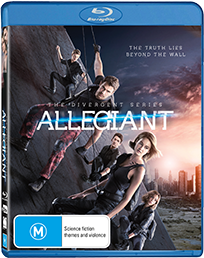 'The Divergent Series: Allegiant' is available on Blu-ray, Digital and DVD on Wednesday the 27th July 2016 from eOne.